Have a spare 15 minutes? 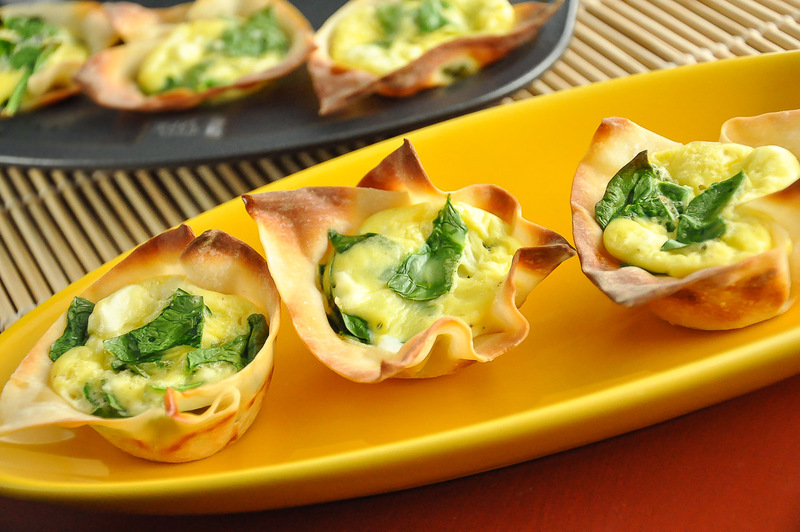 Whip up these spinach and feta won-ton quiche cups in just that! They’re quick, easy, and utterly delicious! Breakfast is served! Whether dining out or whipping up meals at home, people generally fall into two categories: people that try something new and exciting as much as possible, and people that like to stick to the usual suspects at mealtime. I like to frolic in the happy medium between the two and try anything new I can get my hands on, while still honoring my tried and true favorites. Usually that results in me making the same recipes over and over, with little tweaks according to seasonal produce, fridge and pantry contents, and cravings. I could probably share 50 quiche recipes with you for this reason. Today I’ll save you the egg-bardment and highlight the ones I made myself for breakfast this morning. I love breakfast… quiches… and anything that doesn’t t require pots, pans, or a sinkful of dishes. So by default, you already know how much I love these =) I’ve been making these mini quiches like crazy for the past year and recently decided to cut a few corners & make them even speedier! I even turned one into a jalapeno popper! Make a plate for yourself or an entire tray for a crowd! Have a spare 15 minutes? 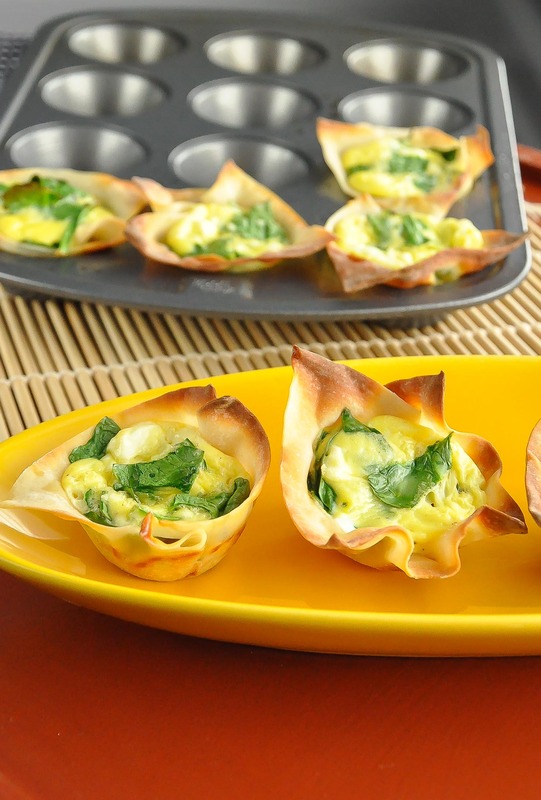 Whip up these spinach and feta won-ton quiche cups in just that! They're quick, easy, and utterly delicious! Breakfast is served! Gently place wonton squares in a mini-muffin tray spritzed with olive oil. Crack eggs into a coffee mug along with 1/2 tablespoon of greek yogurt and beat with a fork. Tear spinach into small pieces and toss into the mug with the eggs along with your spices and crumbled feta. Stir to incorporate and spoon into your won-ton cups. 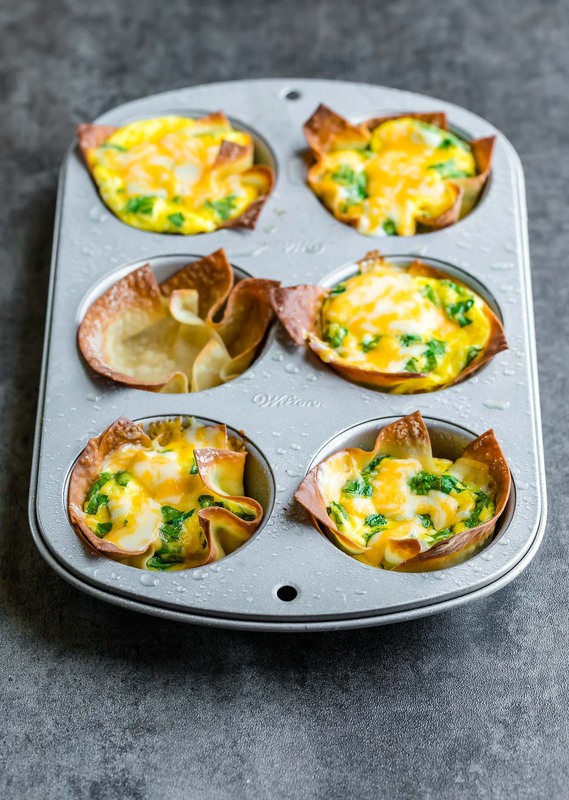 Bake for approx 8-10 minutes or until quiche mixtures fluffs up into a "muffin-top" and the edges of your won-ton cups are toasty + golden brown. When time permits, I highly suggest sauteing the spinach w/ a little oil, garlic, and a pinch of salt. It amps up the flavor of the gorgeous greens and tastes absolutely heavenly! If you haven't invested in a mini muffin tin yet (worth it!) mold 2 won-ton wrappers into a cup in a standard muffin tin. Crisis adverted! Coconut milk pairs nicely with eggs if you’re dairy-free! Ham, bacon, or crumbled turkey sausage rock in these. Need I say more? Gluten-Free? Here’s a recipe for GF wonton wrappers! 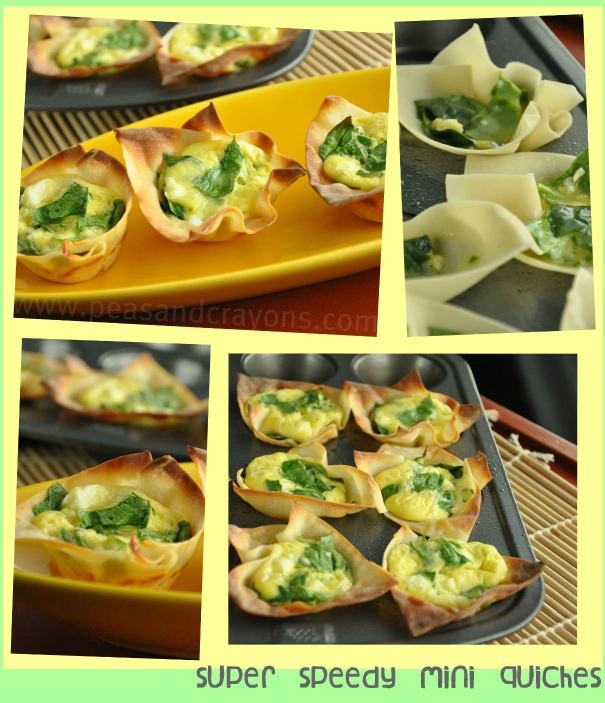 If you get a chance to try these Spinach and Feta Won-ton Quiche Cups, let me know! You can leave me a comment here (LOVE checking those daily!) or tag @PEASandCRAYONS on Instagram so I can happy dance over your creations. I can’t wait to see what you whip up! Ooh and did I mention you can use a full-size muffin tin if you don’t have a mini tin handy? You totally can! You’ll need more “filling” aka egg mixture and will want to use two won-ton squares per muffin cup. Easy peasy! These were the perfect quick and easy appetizer for the baby shower I hosted this past weekend. Everyone loved them! I had some leftover wonton wrappers which I had to use up, so thought I would make this. Looks simple enough. 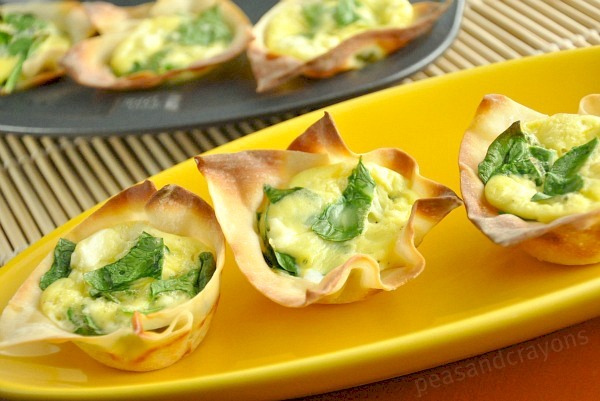 I couldn’t stop myself, these wonton quiche cups are so good! I am all about the bite size food! These are now my go-to dish for any baby or wedding shower…or really any party when I want to surprise people with a fun and unexpected finger food. Can these be frozen? For how long? Or if not freezing them, how far ahead for a Reception? Could the filling be made the day before and refrigerated instead of freezing? Thinking of using this for an appetizer for Easter Lunch, but want to prep as much as I can the day before! I absolutely should have mentioned that, YES! Thanks Amanda! I’ll update it in the post and you can absolutely prep ahead of time with the filling. The assembly and baking part is super quick and easy and would be a perfect Easter lunch appetizer! <3 I hope y'all adore it as much as I do! Just wondering…would you suggest serving these warm (like just out of the oven) or could I make them earlier in the day to bring to an evening party? What a really cool idea! Lovely photos too! Lovely pictures! Thank you for sharing. Wow! Your photos are gorgeous!! I wish you would share some food photography tips though :-). This genuinely looks quick!!! AND it has some of my favorite ingredients so you can bet that I will be making these very soon. LOVE your site and am looking forward to exploring it more. I found you on Foodbuzz btw. Cheers! I can’t wait to try this recipe out asap…I just used fillo dough and my quiches were incredibly light, flaky and delicious! Won Ton wrapper are so much easier though!! Thanks and I hope all is well Jenn! Your gluten-free recipe for wonton wrappers has all-purpose flour in it. How is that gluten free? Oh my god, so cute! 🙂 And I love how easy these are, perfect recipe! Yum! Can’t wait to try these this week! Would have never thought to make quiche this way! OH WOW I LOVE THE COMBO! Really good appetizer! I don’t I could make the entire tray for a crowd, I think they would all be for me! These look to-die-for good. I am going to try to make a vegan version. Thanks for the inspiration. Love this! Great idea for a brunch spread. Beautiful idea for a party! I never heard of Nasoya won-ton wrappers (next trip to the asian shop I’ll try to spot them out! :)) but I think i can use phillo pastry rectangules… I’ll keep this recipe in mind! These look delicious! What a fun way to start your morning! I think I’m the one who likes to try something new every day. Honey Bunny would like some repeats…but I keep telling him I’ve moved onto a new recipe! Those are really cute. I wonder if phylo dough or pieces of tortilla would work since I have those on hand. So cute…the slow cooker soup was a winner tonight. Thanks again for the recipe. The savory garlic and butter buns (a la cinnamon buns) recipe not so much. Oh well, can’t please em all. Im going to blow your mind here- use reg muffin pan, put in some cooked quinoa and pat down, bake for 10min, fill with you eggy (or swap in soft tofu!!) stuff and bake again. Crazy good and a bit more filling. Also fab with polenta. You are just too much! I juts happen to have some wonton wrappers sitting in my fridge that I don’t know what to do with. I knew I could come here for ideas. 🙂 These look amazing! This is such an egg-tastic day! The #ebwhites chat and your beautiful eggy post. Must try these. Thanks for the share! I fall some where in the middle too, but lean on the adventurous side. All those recipe magazines have to go to use! Ooh this looks fab! I have phyllo pastry – I could use that instead of wonton wraps I think? Looks yum! I used wonton wraps a couple weeks ago and now I am addicted to them! They are so versatile and so easy. My 5 year old would love these. Breakfast for dinner is her favorite. Hi Jenn! Thanks for stopping by my blog! I LOVE yours!! Your pictures are GORGEOUS! I am totally going to give the gluten-free version of this quiche a try–it looks YUMMY! Cute & awesome,perfect finger food! I always forget about quiche! But you’re right its so easy and quick…and delish. Wow, that looks DELICIOUS!!! Just wanted to stop by to tell you I did the Celery Hearts with my little ones and blogged about it! Thanks for the memories! Oh wow! I definitely have to try these out! YUMMY! I love trying new recipes but I am the same as you…I still have my tried and true favs that I just play around with once in awhile. 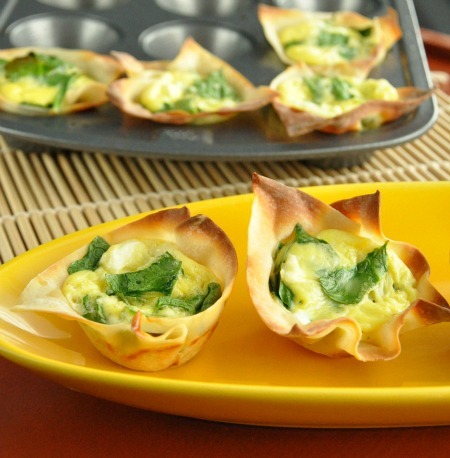 I love quiche or really any egg dishes! Thanks for sharing! 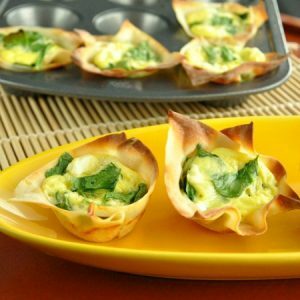 I just hopped on the mini-quiche bandwagon recently because they are so delicious and healthy and portable. These wonton crusts? This is genius! A crunchy crust without all the fat. Yum!! Holy cow these look so yummy! Your pictures are awesome too! So yummy looking! You should cook me dinner sometime. Oh I love the use of won-ton wrappers. Looks like they make it just as easy as say a pre-made phyllo cup. Quiche though is fantastic and the less dishes it creates the better!!!! What a great idea! I think I’m going to have to try these this weekend. Super speedy and super cute! I am in the middle too: this week we are all about basics after all that V-Day extravaganza. Potatoes, cornmeal, cabbage, roots. This is the most amazing idea and I must make this, maybe even today. I play with wontons, quite often but never even thought of such a creative dish. Yummy! I gotta be some wonton wrappers and try these soon! have i told you lately that i love you! making this this weekend for my egg party. it’s like you read my mind and already my request in my post today! what a great idea and how adorable these are!! These sound so good, Jenn and If I didn’t tell him, I don’t think Ralph would know there was yogurt in it. Yum…Thanks! I love all of your wonton cups! These would be awesome for a brunch party/shower. So pretty too! These look so amazing, I will be trying these!! I do like trying new and exciting foods!!! I think we need to rename you queen of the wonton! This is another awesome looking recipe Jen! I’m a weird hybrid of those two personalities. I take a dish I like and make as many different varities as I possibly can. What a great use of Won Ton wrappers! yum! These look freaking delicious. Definately need to try these!